Healthy recipe for SCI diet and easy for carers. 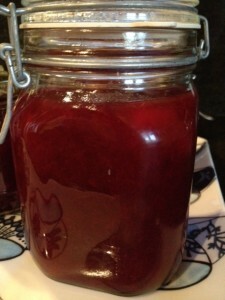 I am time poor but jams, pickles and chutneys are easy and fairly quick to cook. There are nutritional benefits to home cooked preserves and the sense of achievement encourages me every time I pass in-season produce. I love healthy foods in the fridge and pantry and having a variety of preserves is advantageous as a carer as I’m always prepared! Originally food was preserved so it could be kept for year round consumption. Nowadays preserving seasonal foods at home can be cheaper than shop bought products especially if you grow your own ingredients. Homemade jams, pickles and chutneys are healthier with no added preservatives. I enjoy giving my filled jars as gifts as a real sense of my time and energy in the present. My children love being involved too, the seasonal production of apple chutney is a highlight in our kitchen. I have a well-thumbed, sticky home preserves cook book, published in 1979, the recipes are just as delicious today. With experience I add less sugar as my taste buds like sharp marmalade, my apple chutney can vary depending on the raisins purchased. That’s why cooking appeals to me, I can make a recipe my own with a tweak. 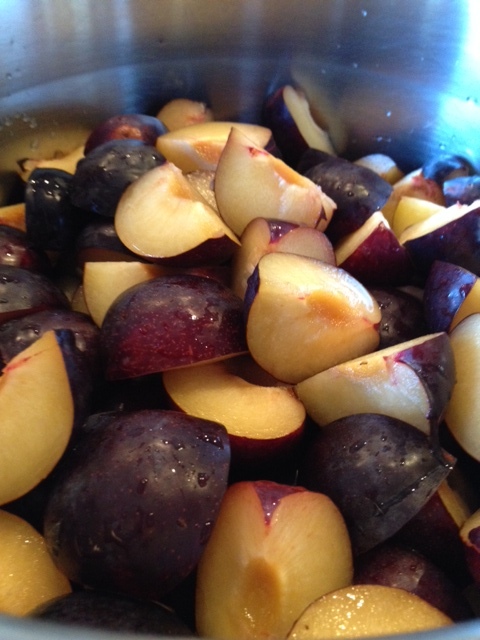 The recipe below is delicious using Autumn plums. I didn’t boil mine too rapidly so less jam-like and more very thick stewed fruit, absolutely divine on breakfast yogurt, perfect at lunch on whole grain bread and cheese. Add a fruity dollop into rice pudding or semolina dessert. Ideal on scones and with jam this good no one needs cream. Place fruit, water and lemon juice in a large heavy-based saucepan on medium heat. Bring to the boil and cook for 20 minutes, or until fruit is soft. Meanwhile, warm sugar either by placing sugar in a heatproof bowl in the oven, or in the microwave. Add the sugar to the stewed fruit, and stir well until sugar dissolves. Increase heat and cook, stirring often, for 15–20 minutes. To check if jam has reached setting point, place 1 teaspoon of mixture onto a chilled plate. Tip the plate; if the jam runs, cook for a further 5 minutes, then try again. Pour into sterilised jars while still hot. This entry was posted in Lifestyle Choices, SCI Diet and tagged Diet, Healthy choices, Healthy eating, Nutrition, Recipes by everydaycarer. Bookmark the permalink. I love making jam and marmalade too but now there aren’t many at home,my jars sit for ages. I am seriously considering a car boot sale to off load it all but it is very therapeutic making it. Dear Anne – I got mathematician Martha to half and quarter all my jam, marmalade and chutney recipes (written in pencil in the cook book sidelines) so I make smaller batches in a heavy saucepan not my usual enormous witches cauldron!!! We make large batches at Christmas for presents.